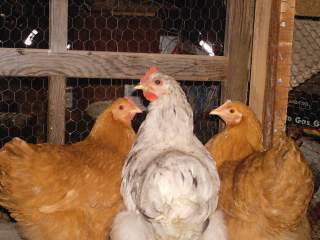 This page is for updates and pictures for our broody Buff Orpington hen, Setherina, and her three eggs that she's sitting on. They are planned to hatch around the 2nd week of June, 2009. Check back for more updates and pictures! 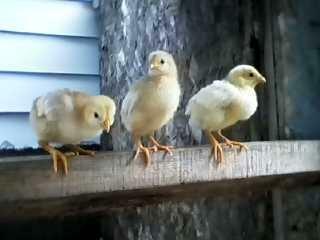 Here's a family photo: Caramel, Foghorn(one of the fathers), and Setherina. 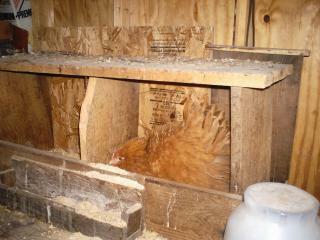 Setherina in her nest box. 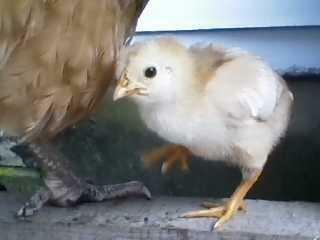 She ruffles up her feathers and growls whenever she sees someone, but has never pecked at us when we touched her eggs. She's so sweet and will probably make a great mother. Setherina sitting on her eggs. 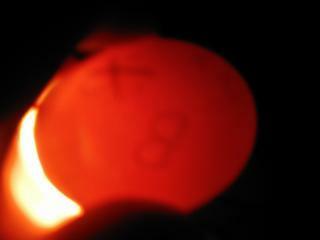 Setherina started off with 10+ eggs that were "Maybe's" or "Fertile's", but now 4 of the eggs actually have developed, lively chicks in them(the last time I candled). 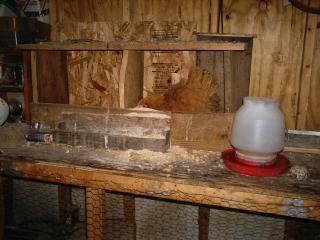 Now we are just waiting for the chicks to decided when to hatch. COME ON CHICKIES! YOU CAN DO IT!! 10/20/09: Peanut, Juno, and Suzy are all grown up (almost, anyways). Setherina was a wonderful mother for them. Foghorn ignored them and we didn't have any problems with him pecking them. Setherina took good care of them. Now, she still hangs out with them when they free range and we've noticed that now that they are older, she sometimes pecks them when they try to follow her like chicks. She must know that it's time for them to grow up. They have all their feathers and their voices are changing from the usual high-pitched chirping to a deeper voice. Juno might actually be a rooster, so we will probably have to sell him. 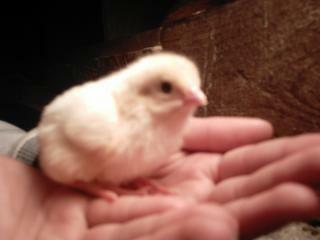 But Peanut and Suzy are most definitely pullets! I can't wait until they start laying! Juno, about a week old. Peanut: This was taken very recently (10/17/09). Peanut somehow cracked her beak. She's eating and drinking fine, but this is what she looks like now. She got so big!